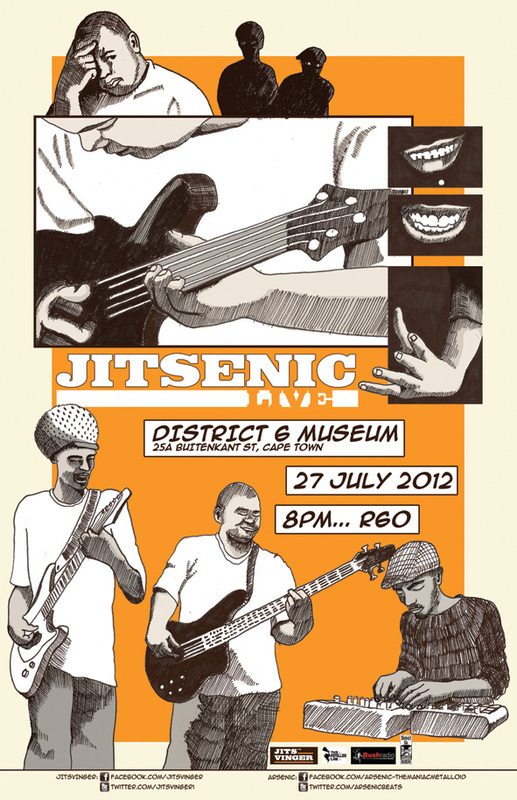 Fresh from his show in Grahamstown, Cape Town musician Jitsvinger presents Jitsenic at the District Six Museum on Friday 27 July, 2012. Jitsenic, Jitsvinger’s latest formula combines his rhyme styles and guitar-playing with the sample triggering, finger-drumming techniques of Arsenic (Gary Erfort). The upcoming Jitsenic performance will introduce its newest member, Andre Hope, who will be completing the ‘sound-system’ by adding savvy bass grooves to the mix. Consisting of two sets, the show features Jitsvinger who will be switching moods from acoustic guitar and poetry to electric guitar. Those who know Jitsvinger’s repertoire can look forward to hearing familiar classics such as ‘Smile’ and ‘Doenit’ from his debut album ‘Skeletsleutel’, as well as new unreleased tracks he has been working on with Arsenic. Jitsvinger mastered his art form through successful projects like Khoi Khollektiv, Rogue State of Mind and the critically-acclaimed Afrikaaps, which earned various awards and rave reviews, both locally and internationally. All of these projects experimented with different modes of expression from storytelling to word-play. In this spirit, Jitsenic features a fusion where old meets new South African sounds, with the audience being taken on an artistic, lyrical, and music journey. Tickets cost is R60 and available from Thursday 19 July, 2012, at the District Six Museum.